Ashwaganda is something that you are going to start hearing more about. We've all seen those infomercials that have the "latest and greatest" in ingredients. Most of the ingredients are what I would imagine is a crushed up leaf put into a capsule and sold as a magic pill. There are many "cure all" supplements out there touting claims of unbelievable performance, weight loss, or whatever else they want. So needless to say I was skeptical when I started reading about this. I did some research for a few days and realized that there's a lot of science behind ashwagandha and it may be worth checking out. I'll go over my thoughts about this herb later, but let's learn more about it. 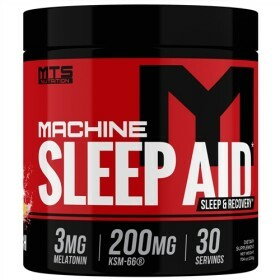 Click here to order Machine Sleep Aid now. After some of my research, I liked what I was reading. Solid sources of information all confirmed the same things, so what exactly is it? Ashwagandha is an herb that has been said to have some rejuvenating properties; both physical and emotional. It's often referred to as "Indian ginseng" and has been shown to improve your overall well-being and longevity. The name ashwagandha actually translates to "horse smell" and it accurately describes this herb. This herb has gained popularity over the years, but it's been around for thousands of years treating stress, increasing energy, and improving performance. It's an adaptogen. That means that it is believed to help the body adapt to stress and help keep a normalized effect on bodily processes. It basically helps fix things that are out of whack in your body. Since none of my friends can even say ashwagandha (neither can I), I didn't really have many people to ask their input about it. Every day we are inundated with commercials and information about new breakthroughs in the supplement industry, but consumers generally don't know much about what they are taking. While this is alright for the most part, knowing exactly what's going in your body is important. Do your due diligence and study about everything you take. Don't get me wrong, I ingest stuff too without even reading the labels. Luckily, we have the Internet that we can use trusted sources to find out information about anything. A simple Google search for "the benefits of ashwagandha" will give you thousands of results. Think this is still a fad? Let's go over some of the scientific benefits to Ashwagandha. What are the scientific benefits? Ashwagandha, also known as Withania somnifera in the science world, actually lives up to the hype. Ashwagandha helps when coping with stress. Bad time in life? Ashwagandha may help. The herb has proven to increase stamina in adult rats. This leads us to believe that this herb increases your stamina. Going along with the "Indian ginseng" nickname, ashwagandha has been shown to reduce the signs of aging. Due to ashwagandha's ability to balance hormones and fix things that are out of whack, it has been used to treat fertility problems in men and it also increases sexual desire in women. Ashwagandha fights adrenal fatigue as well as fighting diseases such as Alzheimer's, Parkinson's, Huntington's, arthritis, diabetes, and hypertension. You can topically heal wounds, muscle aches, and inflammation. Ashwagandha reduces depression and brain cell degeneration. It also stabilizes blood sugar levels, helps lower cholesterol, and helps prevent and treat cancer. Just like any fad diet or supplement, I tend to steer clear of it. I'm glad I did my research. This herb seems to live up to its name, and it's awesome. Its stress relief is similar to other smokable herbs, I've been sleeping better, and everything is starting to look up. Dealing with emotional eating, ashwagandha has helped with the trigger as well as keeping me even keel throughout the day. I lift more, have more energy, and I feel better overall incorporating this into my regimen. Ashwagandha is about as fun typing it as it is tasting it. By itself, it looks like cinnamon but tastes nothing like it. Finding a quality supplement with ashwagandha in it should keep the bad flavor at bay. I'd never tell anyone how to live or what to take, but I invite you to the idea that ashwagandha is an herb that really does help with many aspects of life. Ashwagandha has some great synergistic effects when combined with Gamma Animobutyric Acid (GABA) and melatonin. Have started to see this in different types of supplements, very interesting ingredient. This sounds great! I definitely give it a whirl! More sleep and less stress sounds amazing! I’m going to have to give this herb a try, I’m always stressed because of whole and not getting enough sleep.